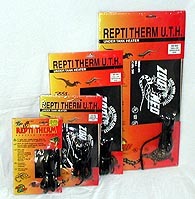 A mini size reptile heater ideal for small terrariums 1-5 gallons in size. Ideal for small terrariums housing hermit crabs, small lizards, tarantulas, salamanders and frogs. Safe and accurate nichrome heating element that lasts for years. Full one year warranty.